Changi Airport is not only a place where travellers spend their hours before a flight sauntering across its retail space or relishing meals in its diverse eateries. It is also where families head to spend time together, couples enjoy the sight of planes take flight and students study in choice areas with their friends. 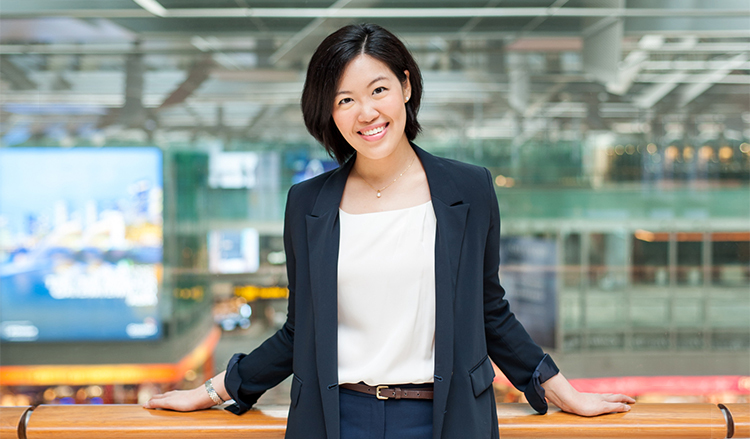 Today, as part of the Airside Concession Operations team, Samantha ensures that the retail, food and beverage, and service concessionaries operate to high standards that are commensurate with Changi Airport’s international standing. She tells us, “My responsibilities include sales analysis, policy review, collaboration with tenants on sales initiatives and the monitoring of industry regulations. CAG has given Samantha the opportunity to conduct study trips to airports in Hong Kong, Taiwan, China, UK, Germany and France. She was also privileged to attend industry conferences in Europe and Asia, such as the Tax Free World Association (TFWA) conference in Cannes, France. The conference allowed her to meet luxury brand principals to discuss potential collaborations for the coming year. Although Samantha has gained a better understanding of the travel retail industry in the past five years, she tells us that it is only one aspect in the vast operation of airport management. She shares, “I look forward to learning more about the different aspects of airport management. My involvement in cross-functional projects such as the upgrading of Terminal 1 and the planning for Terminal 4 has offered me valuable insights into my colleagues’ work in other divisions. The inaugural MOHH Healthcare Attachment Programme was launched in January 2015 – students selected for the HAP share their experiences here!